Here you will find detailed postings of recent projects. You can browse through the different case studies to see how projects similar to yours have turned out. 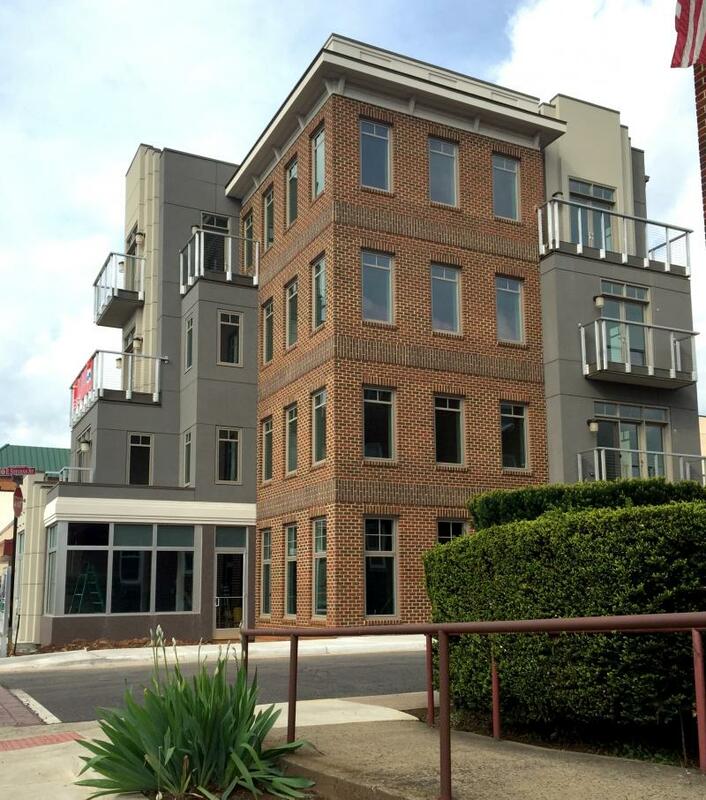 Downtown Culpeper revitalization continues with the completion of the new headquarters building for Brown Harris Wealth Management. 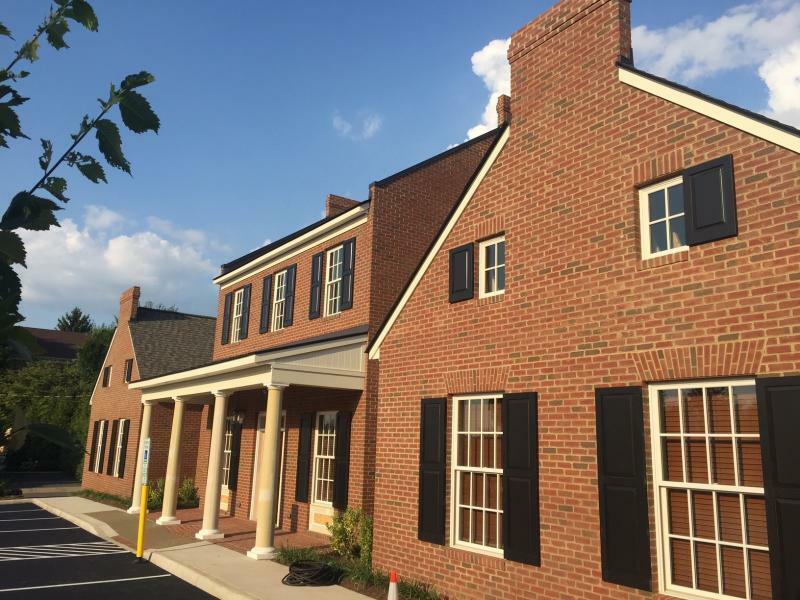 Previously the site of NAPA Auto Parts, a donut shop, a service station as well as the original location of the 19th century cottage now around the corner, the new building recalls the historic form & scale of the 18th & 19th century residences that originally lined Coleman (now Main) Street. 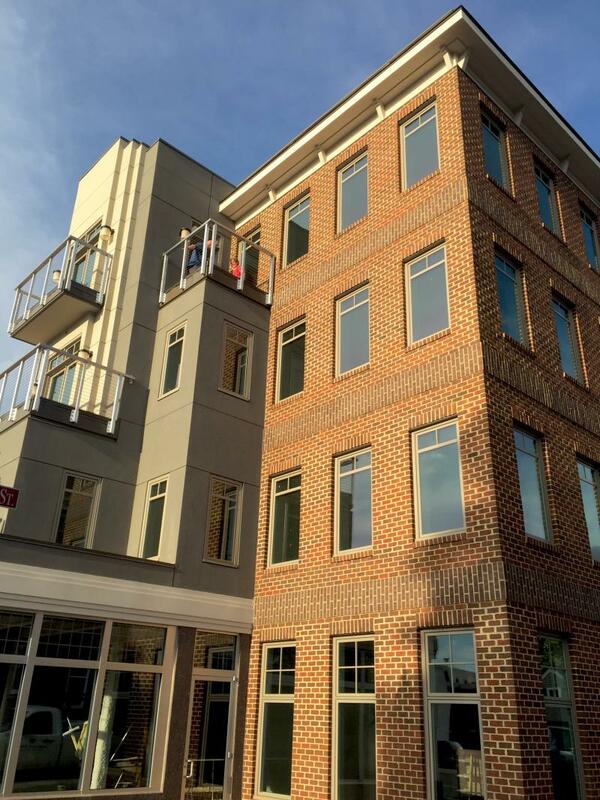 General Contractor: Taft Construction, Inc.
Construction is completed on Culpeper's first new 4-story building. Sandwiched between two Culpeper landmarks, the building is designed to ease the transition between the Georgian Revival Lord Culpeper Hotel and the Art Deco State Theater. The stepped facade provides the apartment units with outdoor balconies and serves to relieve the vertical impact of a 4-story mass on the street. Plan offsets create outdoor dining space for the proposed ground-floor restaurant. 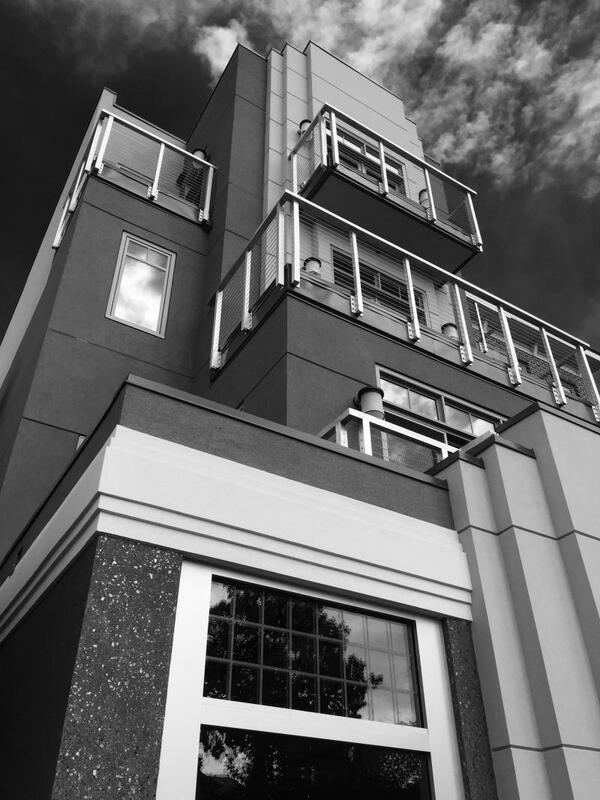 Stepped wall planes and stucco surfaces recall the design of the State Theater and other nearby Art Deco-era buildings while the projected cornice and brick exterior blends with the neighboring Lord Culpeper Hotel. 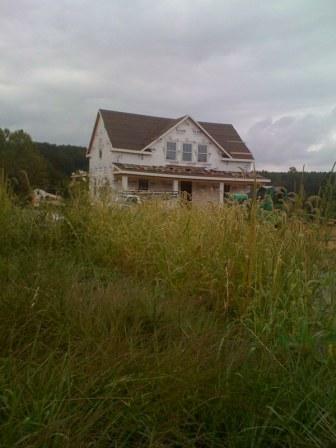 Construction of this home began in June 2008 and the progress will be featured here until completion. The Owners had recently purchased this lot with beautiful mountain views and wanted to build a smaller home for their retirement. Their program called for single-level living space for two people, plus room for guests and visiting family. They requested an open plan with informal living spaces and plenty of windows to take advantage of natural light and the spectacular views. In addition, the plan needed to accomodate the Owner's collections and furnishings gathered from years of travelling around the world. To ensure functionality and to bring added flair, Sandra Brannock of NVS Kitchens, was brought in to plan a kitchen suited to the owner's needs. The Design and Architecture award for 'Best One-of-Kind Custom Home Under One Million Dollars' was announced at the 2009 GALA Awards banquet held on September 29th at the Ritz-Carlton in Tysons Corner. The award was conferred by the judges on behalf of The Maryland-National Capital Building Industry Association, the Northern Virginia Building Industry Association and the Washington Metropolitan Sales and Marketing Council. The home's owners were pleased to hear of the announcement. "The judges have confirmed what we have known for some time, that you designed a beautiful and functional One-of-a-Kind home for us. You have a gift of listening to our wishes and being able to translate these dreams into reality. We love our Virginia Mountain Home!" For an architect, or any building industry professional, that kind of homeowner appreciation is still the best award of all. On behalf of the building team, thanks to the Owners for the opportunity to work on such a challenging and rewarding program. Computer-generated rendering showing the view from the front entance. Front & rear elevations drawings. July 1, 2008: Photo showing the rear of the house. A windowed cupola will be placed at the top of the upper roof. Roofing, soffit, windows and exterior trim are in place. The cupola recalls similar elements found on old barns throughout the region. Great Room begins to take shape. 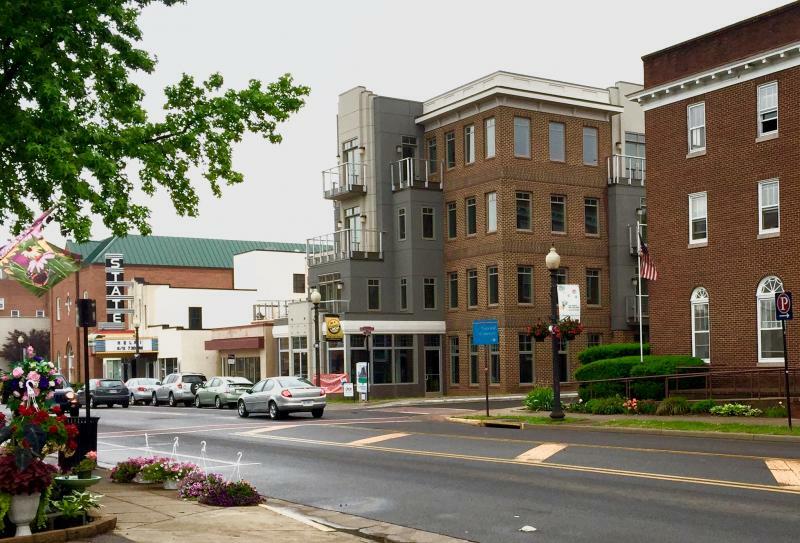 Washington, Virginia has recently changed hands. The new owners have completely remodeled the interior with an eye towards maximizing the views to the surrounding countryside. and additions to the property. 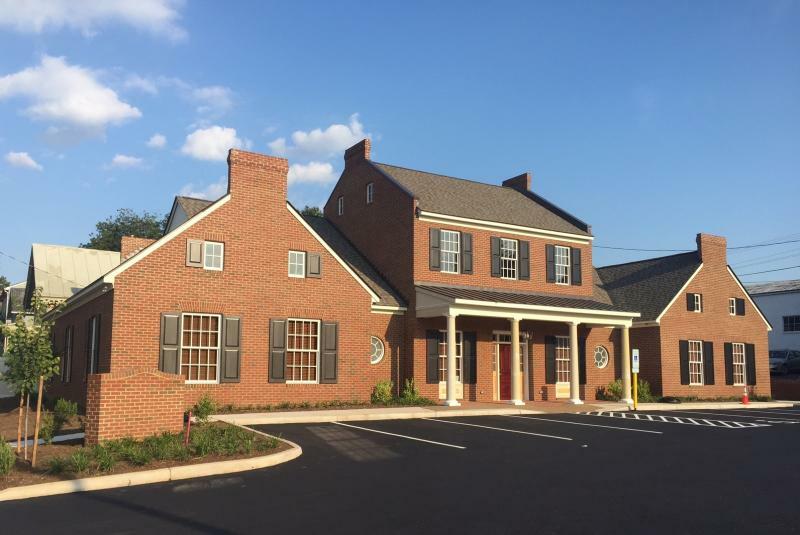 Design of an addition to the popular pub and the remodeling of an existing lodging facility are has been completed as well. More pictures and facility information can be seen at www.thebluerockinn.com . VIRGINIA FARM HOUSE, madison county, va. The owners sold a home in the Clifton area (also designed by MLA) and purchased land in Madison County. 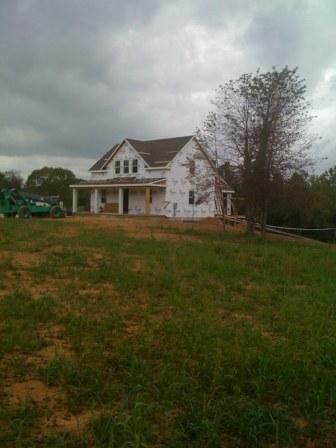 This home is being built as a guest house to serve as part of a larger rural homestead. It is sited down the hill from the site of the main home, nestled by the bank of a pond and a small stream. 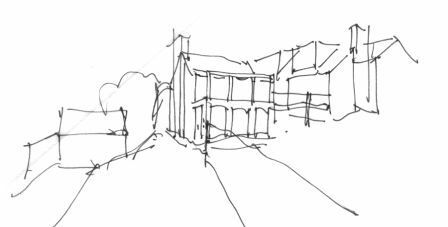 The form and materials are intended to mimic the simple farmhouse design of many of the neighboring 18th & 19th century properties. It is simple to the extent that throughout the house, only one size of window is used. Though relatively small, the home offers plenty of space for family visits, and features 3 porches for enjoying the scenery. While the house is under construction, the owners are planting the grounds with berries, fruit trees and a garden maze. Sometimes it's not about contemporary drama, but quiet comfort that doesn't call attention to itself. 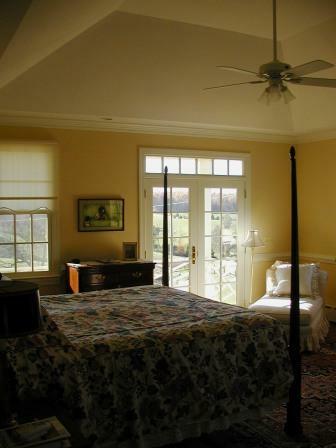 This home has a unique split-master bedroom layout to accomodate two family members returning to the area of their family homeplace. Recent addition was bright and airy, but the large "L" shaped sunroom presented challenges to the new owners. Kitchen in the original section of the house was dark and detached from the more inviting sunroom. A 10'x10' addition is nestled into the "L", and angles are introduced to enliven and delineate the different zones within the new volume. Old walls are opened up to bring light into the older portions of the home. Sight lines and traffic flow integrate the old and new spaces. View from new kitchen thru sunroom to office beyond. Here is one of the most frequently encountered remodeling programs. The owners have a charming older home in a beautiful location, and want to add a first-floor master bedroom suite. 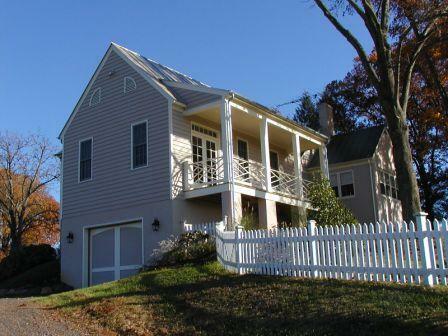 The resulting design follows the grade as it slopes to the farm driveway to provide garage in the lower level. The porch is oriented to feature a view of the restored c. 1741 log cabin on the property. Copyright Michael Lysczek Architect. All rights reserved.